Photography has gone through a sea change over the years since its inception- from a means of documentation to a subject of art. Along with the traditional creative subjects of painting, sketching, designing, architecture etc., Photography has carved a niche for itself all over the world. It helps to build a career which is a perfect mix of creative work and play. Without a well taken photograph, how can we get attracted to exotic food and sublime beaches; Trendy Fashions and Glamorous Models? How can we get fascinated by the rich wildlife without the real colours and expressions captured through lens? Photography has always been a lucrative career option, but undervalued in the Indian sub-continent. However, with the advent of internet, a huge market has opened up for Photographers all over, giving a large platform to the viewers. Many pursue it as a hobby and some choose it as a profession, however a thorough knowledge of photography as a subject will make you stand out from the crowd and make your photographs worthy enough for a second glance. The B.Sc. in Photography program plays an important part in shaping your photographic talents. It will help your photographs linger in the minds of the viewers and will often be admired. 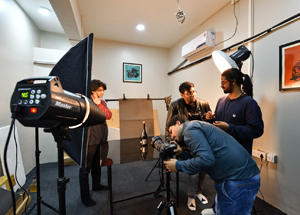 A state of art photography studio with all modern facilities is there for students. The studio is very well equipped with high end cameras, lenses, lights etc. The studio also houses the industry standard light modifiers, light shaping tools etc. The University follows Choice Based Credit System (CBCS), which provides choice for students to select from the prescribed set of courses and earn credits. Students are awarded grades based on their performance for each courses in a semester and Semester Grade Point Average (SGPA), which is a measure of academic performance of a student in a semester. Cumulative Grade Point Average (CGPA) is used as a measure of overall cumulative performance of a student over all semesters. However, the CGPA is invariably calculated from second semester onwards to facilitate students to know their academic progress. Every Programme has a prescribed Curriculum or the Scheme of Teaching and Evaluation. It prescribes all the courses/ laboratory/ other requirements for the degree and sets out the nominal sequence semester wise. Curriculum also includes SWAYAM and Massive Open Online Courses (MOOCs), offered by premier institutions. A student desirous of additional exposure to a course, without the rigors of obtaining a good grade, ‘audits’ a course that helps him to have an edge over others in placements. The evaluation system to assess the student is comprehensive and continuous during the entire period of Semester, by the faculty who is teaching the course. Continuous Internal Evaluation (CIE) and Semester End Examination (SEE) constitute the major evaluations prescribed for each course, with only those students maintaining a minimum standard in CIE are permitted to appear in SEE of the course. CIE and SEE to carry 50% weightage each, to enable the course to be evaluated for a total of 100 marks, irrespective of its credits. Before the start of the Academic session of each semester, a faculty may choose for his course Internal Assessment Test and a minimum of two of the following assessment methods with suitable weightage for each: Assignments (Individual and/or Group), Seminars, Quizzes, Group Discussions, Case studies/Case lets, Practical orientation on Design Thinking, Creativity & Innovation, Participatory & Industry-integrated learning, Practical activities / problem solving exercises, Class presentations, Analysis of Industry/Technical/Business Reports, Reports on Guest Lectures / Webinars / Industrial Visits, Industrial / Social / Rural projects, Participation in Seminars/ Academic Events/Symposia, etc. or any other academic activity. The Semester End Examination for all the courses for which students registered during the semester shall be conducted at the end of each semester. Some of the courses, where the student performance is evaluated through CIE, may not have SEE. The makeup examination facility shall be available to those students who have appeared and failed in the SEE in one or more courses in a semester.